Starring Hermann Göring, Joachim von Ribbentrop, Albert Speer, Rudolf Hess, Adolph Hitler and many more. This is not really much of a movie or even a conventional documentary. It is simply well organized and a narrated news reel film. 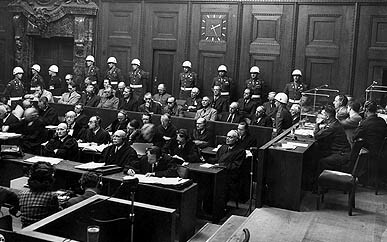 Completed in 1948 but not shown until 2010, Nuremberg: Its Lesson For Today is a cinematic record of one of the most important trials of the 20th Century. It beats the O.J. Simpson films and the Casey Anthony melodrama by a long shot—mainly because the Nuremberg trials were very important and argued by really good lawyers. Better yet, well reasoned verdicts were reached. Nuremberg: Its Lesson for Today was written, directed and edited by Stuart Schulberg, who compiled footage shot during the first Nuremberg trial of 1945 and 1946. TMG and most folks are just now seeing his work in mainstream theatres in late 2011. The film is 100% archival Nazi-shot footage of the trial itself and film evidence presented during the trial. Several dozen high Nazi officials were charged with crimes against humanity, war crimes and crimes against peace. Several things really stand out. One is the outstanding opening statement and closing by chief prosecutor Robert H. Jackson. Jackson was an Associate Justice of the United States Supreme Court (1941–1954). Perhaps his outstanding performance is best explained by the fact that Jackson was not a typical lawyer by today’s standards—-he never graduated from any law school. As a result, he was simple, clear and direct. The opposite of this would be Chris Darden’s in the 1995, O.J. Simpson trial–clearly the worst opening statement that anyone has ever heard. The other striking fact is that each defendant was clearly judged and sentenced with individual evidence proof and clarity. Rather than “hang all the bastards” the jury carefully awarded sentences ranging from acquittal to 10 years, to life, to death by hanging. While nothing new is presented or revealed that is not heavily engraved in hundreds of history books, I did learn a great deal from this film. It was truly revealing that all the Nazi leaders blamed everyone but themselves—as if Hitler carried out all the evil single handedly. Equally interesting were the carefully laid out promises and statements where Hitler said one thing, but then acted just the opposite. Gee, where have we seen that lately in a charismatic U.S. President? No one can or should be compared to Adolf Hitler…but his tactics to disarm the people, manipulate and own the media and turn a country upside down in only three years (1935-38), are clearly lessons not to be forgotten. Everyone sixteen years of age or older should see this film. It should be mandatory for all high school history courses.